The band has performs regularly throughout the year at local festivals, private bookings, charity and community events, and even performed for Prince Charles and Timothy Knatchbull at the commissioning of the COPP Memorial. We are always on the look out for people who want to play for pleasure, and join a fun group. Please bring your sense of humour! Acoustic guitarists looking for company, please give us a try. We are looking to recruit regular percussionists also. 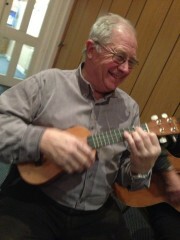 Please scroll down to read more about playing ukulele, guitar, percussion or singing in the Igloo Band. This band is good fun to be part of, and continues to develop our members’ musicianship at a pace appropriate to the individual. This is a great opportunity to ‘learn on the job’ once you have covered the basic skills on your instrument, and a wonderful outlet for all that practice you have done to be able to play. Look out also for our ‘Training band’ courses on the events calendar for instrumentalists who would like to cover some of the band’s back catalogue before leaping into full rehearsals. 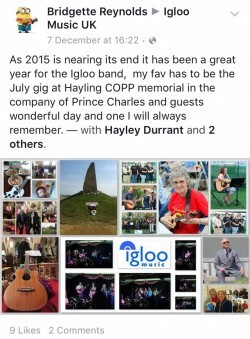 The Igloo Band meets two evenings a month to rehearse play a range of music, from rock, pop, reggae and folk to blues. 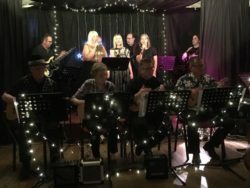 We get people together to play music also at our monthly Igloo Jam Night, exclusive to Igloo members; band members get free entry to this also, with their membership. The Igloo Band brings people together from all walks of life, playing a variety of music across the ages. 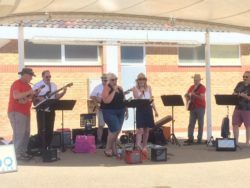 Our Band Members enjoy taking part in lots of (optional) performance opportunities, of note, our Annual Igloo Music Showcase which is open to all of our members, no matter how long they’ve been learning. 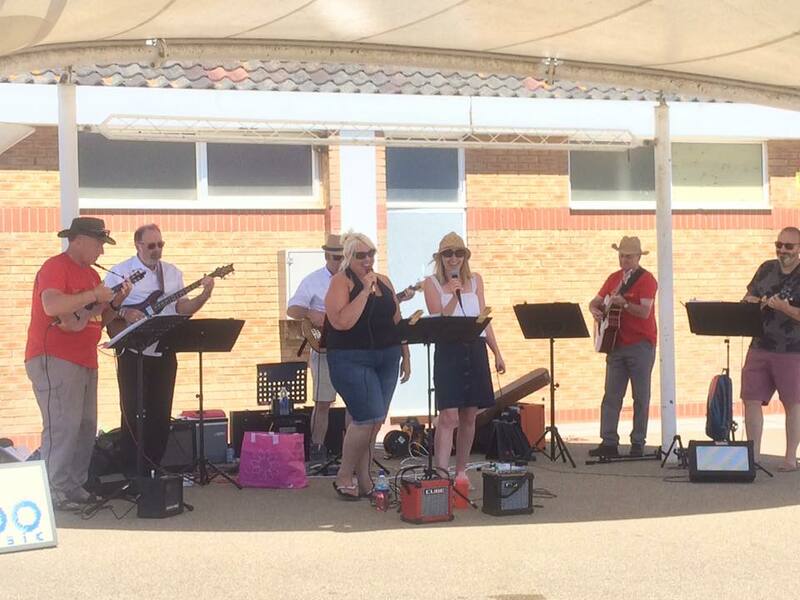 We also be played at the Southampton Maritime Festival this summer and other local events. 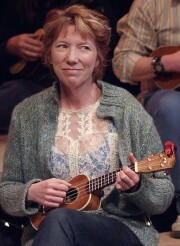 Playing ukulele in the band.. When you hear or play a ukulele, you can’t help but smile, and as it is quick to learn compared to other musical instruments. The ukulele is a lovely, small, accessible and portable instrument, but you don’t get the sense of how powerful it is until you play it in a group. 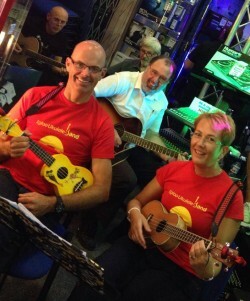 We are thrilled that so many people have discovered music through our ukulele groups – some people well in to retirement. Before joining, you should think about some private lessons, taking the beginner ukulele course or training band sessions if you have not been playing for long. The friendly office team will be glad you advise you if you would like to get in touch. Playing guitar in the band.. This band is ideal for people who had fiddled about at home, or had some private lessons and are looking for an outlet. Guitarists need to be happy to play open chords and a few barre chords (F and Bm mainly) and have some grasp of strumming to get the most out of this group. If you are a little rusty but think it’s not far out of your reach, then drop the team a line and we can arrange a couple of refresher private lessons for you to get you up to speed. We currently have a vacancy for one adult singer in the band. You should have some grasp of basic vocal technique – think about taking the beginner singers’ course if you’re not sure – and be interested in learning to perform. An informal interview may be required to make sure the band is a suitable activity for you at this time. Contact us to discuss if you’d like to find out more, we’d be pleased to hear from you. Playing bass or percussion in the band..
We are currently looking for 2 permanent percussionists to join the Igloo Band. If you’re interested in finding out more, please do let us know!